Find out the latest news from SMA Mineral. Many large, complex manufacturing processes are dependent on limestone products – just at the right moment. Which is why quick and secure transport operations are important. How does it work? Come and have a look, from order to delivery! We wish you all a Merry Christmas. 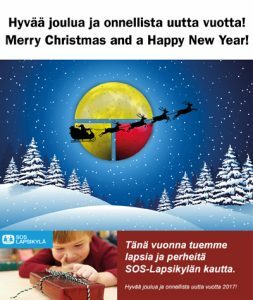 This Christmas we give our gift to SOS Children's Villages. SMA Mineral produces agricultural lime at four units in Falköping, Stigtomta, Rättvik and Filipstad. Annual sales are 30,000–40,000 tonnes, from Hälsingland in the north to Kalmar in the south. Michael Isoz, a landowner and farmer near Trosa in Sörmland, sees considerable advantages in using liming to improve soil structure, and he has a good working relationship with SMA Mineral. “Liming doesn’t solve every problem, but it does make life that bit easier and provides greater stability on a day-to-day basis,” he says. SMA Mineral supports the Algoland research project. One of the aims of the project is to bind carbon dioxide from the lime and cement industry's flue gasses to algae that can then be used as fodder, raw materials for chemicals, biofuel etc. How to convert lime sludge into top-quality lime. Hello Magnus Öman, MD of Svensk Oljeåtervinning*. You recycle waste oil – tell us more! “Exactly! We collect different types of waste oil. Mainly oil from shipping, car workshops and industries. Mälarbanan – a race against the clock. SMA Mineral was commissioned to deliver KC Binder, lime cement, for the construction of the new railway tracks on Mälarbanan – nothing odd about that. The real challenge turned out to be that the job, which would normally take ten weeks, had to be done in ten days. - 400 tons (of KC Binder) had to be delivered every day day, says Jarek Fastlind at SMA Mineral. We wish you all a Merry Christmas. This Christmas we give our gift to SOS Childrens Village. What does limestone have to do with fish in Vemdalen? A lot! After years of acidified watercourses, liming was carried out and the trout, a species that was dying out, have now found their way back. SMA Mineral annually awards the scholarship "For passioned commitment / social skills at Bergsskolan's graduating class". SMA Mineral Oy became better known to the people as a company – we continue to operate for another hundred years. Kalkkimaa celebration and open doors was held on May 19, 2017 in Tornio. SMA Mineral opened its doors to the Kalkkimaa quarry and in addition for the first tome also for the Ristimaa quarry. SMA Mineral's mine in Kalkkimaa, Finland has been in operation for 100 years. Welcome to our celebration event Friday May 19th. Read about our core values, vision and customer promise. Daniel Juvél, President and CEO at SMA Mineral, describes the companys targets for the future. Oil recovery company Svensk Oljeåtervinning has been part of the SMA Mineral Group since May 2016. The company was started by Cornelis Saers in 2002 is now one of the larger Swedish firms operating in the oil recovery sector. We wish you all a Merry Christmas. This Christmas we give our gift to SOS-Barnbyar. Henrik Torneus and Krister Backlund join our team. Are you a contract customer with SMA Mineral? Our logistics department is always available so you can order quickly and easily. The Energi- & Industridagarna 2016 conference is being held on 16–17 November at Stockholm Waterfront Congress Centre.